Persistent tiredness can be a drag on women's mornings day in and day out, making it almost impossible for them to carry on with their daily tasks. However, morning fatigue does not have to be simply accepted as a way of life. Continue reading to find out answers to your frequently asked questions about morning fatigue to finally start your days off on the right foot from here on out. Fatigue is defined as overwhelming tiredness that isn't relieved by sleep or rest. Consequently, morning fatigue can be defined as a fatigue which occurs only during morning hours. For menopausal women, morning fatigue and weakness can be a consequence of the hormonal imbalance taking place in their bodies as fertile years wind down to an end. During ripe reproductive years, estrogen is the hormone that has been in charge of healthy energy levels and feelings. Therefore, its low levels can cause your mood and libido to tank. However, this imbalance often leads to consistent fatigue for as long as it is not resolved, not just in the morning hours. Having morning fatigue can also be due to certain uncomfortable sleeping arrangements that don't allow you a restful night's sleep - such as light in the bedroom, noise, and a high thermostat - or strenuous exercise routines that take a lot out of you before the afternoon hours. It is important to keep in mind that fatigue that is due to certain nutritional deficiencies - such as lack of iron or vitamin D - or health conditions, like thyroid disorders or anemia, is normally ongoing and does not only occur in the morning hours, similar to fatigue evoked by a hormonal imbalance. How can I treat morning fatigue? Treating morning fatigue and weakness will focus on targeting the underlying cause. For instance, for menopausal women, fatigue treatments will first focus on simple, lifestyle changes that can be enacted. These include an optimized diet rich in phytoestrogens, plant-based estrogens that work to amend the hormonal gap, in addition to regular exercise at least 30 minutes a day, five days a week. Studies have found regular, low-intensity exercise beneficial in decreasing fatigue in sedentary people by 65 percent. For a better outcome, instill the use of alternative medicine proven to promote hormonal balance, including phytoestrogenic herbal supplements - of black cohosh or red clover, for example - or hormone-regulating supplements, like Macafem. For all women suffering from morning fatigue, it would be wise for them to reconsider their bedtime habits to promote optimal sleep, such as refraining from eating at least two hours before bedtime, keeping your room dark and at a comfortable temperature, and establishing a set routine. Women suffering from general fatigue from health conditions and nutritional deficiencies should consult with their healthcare professional for the best line of action in terms of treatment. Morning fatigue is defined as an overwhelming tiredness that occurs only during the morning hours that isn't relieved by sleep or rest. 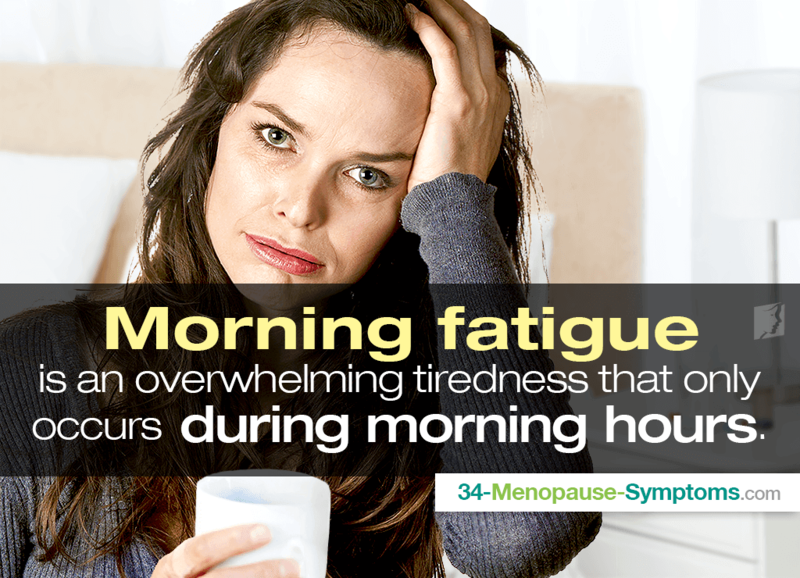 In general, it is common for women passing through the menopausal transition to suffer from general fatigue due to hormonal fluctuations; however, the fatigue can also be triggered by improper sleeping arrangements or strenuous exercise routines. Fatigue that plagues women at all hours of the day is normally symptom of underlying health conditions or nutritional deficiencies. Nevertheless, treatment options are available. Menopausal women should push to target the underlying hormonal imbalance at fault for their persistent drowsiness by partaking in lifestyle changes of an optimized diet and regular exercise with the use of alternative medicine. All women would do well with revising their bedtime routines to promote optimal sleep, and treatment from general fatigue caused by health conditions and nutritional deficiencies should be discussed with a doctor on a case-by-case basis. Rest assured that with proper action, morning fatigue and weakness will no longer bring your sunny days down. Whitbourne, S.K. (2002). The Aging Individual: Physical and Psychological Perspectives, 2nd Edition. New York: Springer Publishing Company. Available from Google Books. This article discusses how you can reduce fatigue during period.Keep reading to find out more about period-related fatigue and what to do about it. To diagnose chronic fatigue syndrome, a doctor must perform a number of tests. Learn more about chronic fatigue tests here.While dealing with chronic fatigue syndrome is a difficult thing to do under any circumstances, it can be even more difficult before you have a diagnosis. Chronic fatigue syndrome (CFS) symptoms are easily mistaken for other conditions. Diagnosis is important for managing the symptoms.